NEW DATE - Manufacturing Companies Invited to Join Governor for 2nd Annual "Buy From Georgia Month"
Hundreds of manufacturing leaders from across Georgia have been invited to participate in the 2015 "BUY FROM GEORGIA" Proclamation event and photo opportunity at the Capitol. This event is about creating more awareness for the manufacturing companies and the products that are proudly made in Georgia. March 4th Governor Nathan Deal will declare the second annual “Buy From Georgia” Month. To mark the occasion Governor Deal will present a proclamation to the leadership of the Georgia Manufacturing Alliance (GMA). 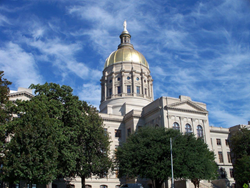 GMA is gearing up for hundreds of Georgia manufacturing companies to be represented at the second annual event to be held in the North Wing at the State Capitol. The proclamation helps bring awareness about the many great products that are manufactured in Georgia and the positive economic impact that is made when businesses and general consumers commit to buy locally.